The global discourse on climate change and food mostly revolves around cultivated foods. The impact of climate change on species that grow in the wild and are used by tribal people or by those living close to forests is rarely studied. Research on wild, uncultivated food plants that are becoming extinct due to changing weather patterns is virtually absent. “When I came to this house after marriage four decades ago, naltenga used to grow in abundance just outside. Now it is rare to find it even in the forest,” says Rashimoni, a sexagenarian living in Assam’s Muktiar Ajarbari Hazong village. Naltenga or Passiflora assamica is a wild edible plant with a sour taste. Small fish cooked with its leaves is a local delicacy. Kolakosu and dhekia xaak plants, says Rashimoni, are also becoming difficult to find in the wild. So much so, that they have started growing these in their kitchen garden. Rashimoni is not alone in noticing this trend. K K Baruah, professor at the Department of Environmental Science, Tezpur University, has observed that many of these plants are on the verge of extinction. “Climate change has caused variations in the flowering and growth of these plants,” Baruah says. Erratic rainfall and temperature leading to forest degradation, coupled with changes in land use, are causing many leafy vegetables and medicinal plants to disappear, says Harisha R P, research associate at Ashoka Trust for Research in Ecology and the Environment, Bengaluru. He gives the example of tribal communities in Karnataka’s Male Mahadeshwara Hills wildlife sanctuary. It has been documented, he says, that these people traditionally used 122 wild plants species. “Now they use only 88 species and the remaining 34 are becoming rare. Around 12 herbaceous species which were a major source of leafy vegetables have disappeared due to low rainfall, invasion of lantana and forest degradation,” he says. 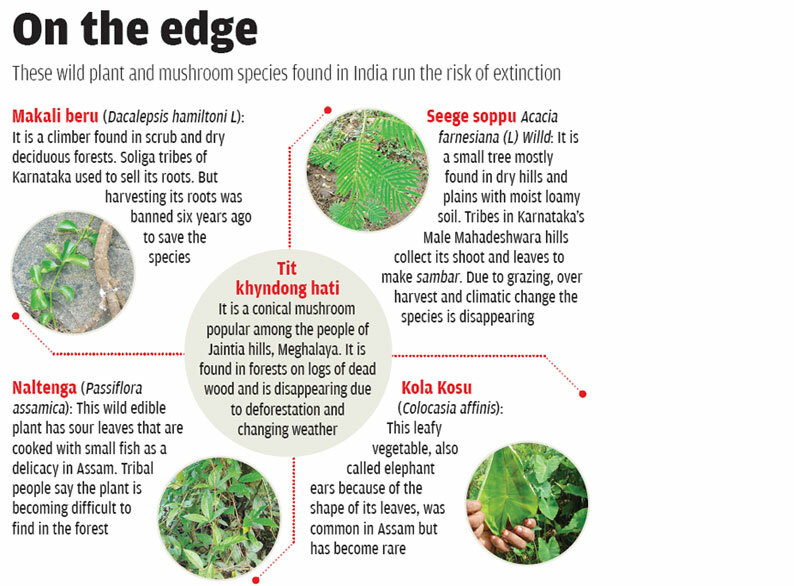 Many varieties of wild edible mushrooms found in Odisha, like amba chhatu and bali chhatu, are becoming rare because of erratic rainfall. 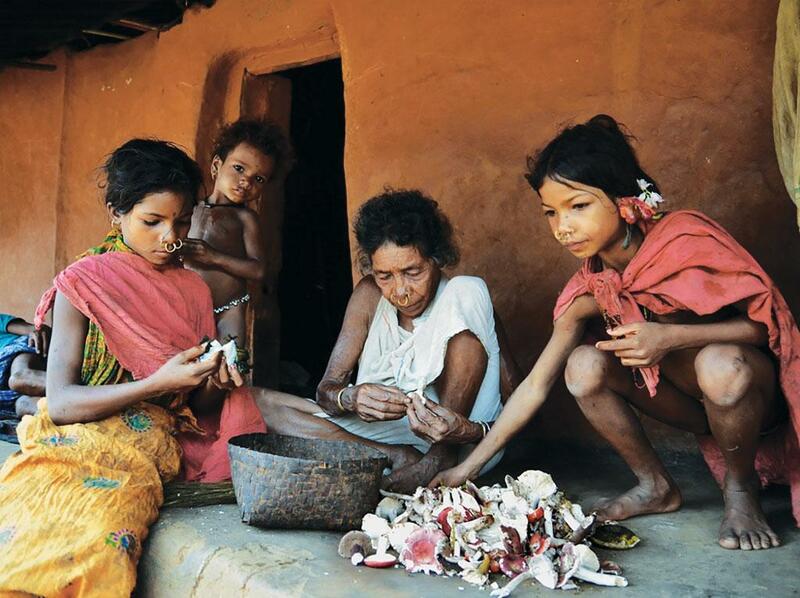 The production of wild edible varieties of jackfruit, mango, tamarind and mushrooms has declined by 25-30 per cent in Rayagada district of Odisha, says Salome Yesudas, a food and nutrition scientist who has worked with the tribal people. A study published in The Lancet in March 2016 says that climate change will lead to per-person reductions of 3.2 per cent in global food availability and be associated with 529,000 deaths worldwide by 2050. In such times, wild food plants could help bridge the hunger gap, but these delicacies too are disappearing. Similarly, some fish species, like the pacamã which is native to the São Francisco river, have almost disappeared. In Angola, the drying of pastures has made life difficult for semi-nomadic ethnic groups such as Mucubal, Cavelocamue and Bibala. The survival of their livestock breeds and the dairy products are, therefore, at risk. Angola’s biodiversity has also been hit by climate change, claims Petrini. Maungo, a moth whose caterpillar is an important source of protein and income for rural communities, is on the verge of extinction. India is particularly vulnerable to this risk, considering 27 per cent of its population depends on non-timber forest produce for subsistence and income. “This dependence is particularly intense for half of India’s 89 million tribal people, the most disadvan-taged section of society, who live in forest fringe areas,” says a 2014 report by the Food and Agriculture Organization. These tribal and rural households, which are dependent on wild foods, risk losing nutrition, health, medicine and economic stability. The country can take its cue from various global efforts to protect the biodiversity in food. For instance, Slow Food International has an initiative called Ark of Taste which catalogues over 2,500 products that run the risk of extinction. The aim is to point out the existence of these foods, draw attention to the risk of their extinction and invite everyone to take protective action. Similarly, the International Fund for Agricultural Development, a specialised agency of the United Nations, has launched an initiative called Recipes for Change to study the impact of climate change on traditional products and encourage small-scale farmers to adapt to it. Launched in December 2014, the initiative involves celebrity chefs who travel to rural areas and cook with local ingredients that are endangered by climate change. Another example is Brazil which issued an ordinance on socio-biodiversity in May 2016 to support nutritionally important native species and make their cultivation attractive for small landholders. “Wild food plants need places to grow. If we destroy nature around us, we won’t have any left, except the most tenacious ones that tolerate and even thrive in urban environments. Nature is very adaptable, but sometimes we change the environ ment so much that we don’t give it a fair chance,” sums up US-based ethnobotanist Joseph Simcox. The story was published in the 1-15 August, 2016 issue of Down To Earth magazine.